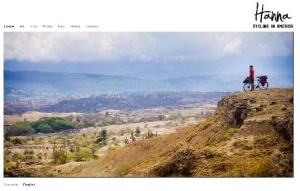 Hanna cycles the Americas – Go Bicycle Touring! Guide to the web's Best Bicycle Touring Blogs and Resources. Hanna is a seasoned traveler who has replaced her backpack with bicycle panniers and decided to cycle the Americas. A trained journalist, she’s a pro at capturing the beauty of bicycle touring, allowing us to cycle right along beside her from the comfort of the couch. The appeal of this website is its elegant simplicity, stunning photos and Hanna’s unique way of viewing the world. I and the bike have been a couple for a year now. In the beginning of our journey in North America, our relationship felt very fresh as we were paving new ground together. Our path through Central America has strengthened us into a symbiotic team. We are now an inseparabel duo of flesh and blood, metal and rubber. After almost loosing the bike, when I got robbed, I have been thinking about what this phase of my life would be without it. Right now the bike is what brings me forward and lets me gather strength to reach even further. I have been a demanding partner and in Panama I am criss-crossing from the Caribbean Sea to the Pacific Ocean. I steer the bike with its rusty handlebar over the mountains, I am rolling down to sea level on tires that cover patched up tubes and I slow down in the traffic of Panama City with worn-out break cables. The bicycle is still sturdy however and so is our relationship. Our one year anniversary is celebrated with a vacation on a sailboat between Central America and South America. The bike rests under a piece of plastic while tied on deck, while I relax on tiny islands and in the big ocean. After four fabulous days we reach Colombia and I am looking forward to continue this happy life with a bike in South America. In addition to her many gifts as a writer, Hanna’s also a talented photographer. Don’t miss the photos! Hanna’s decided it’s finally time to venture out on a long distance dream, maybe she’ll inspire you to follow suit. Follow her tour as she spins south towards Ushuaia. 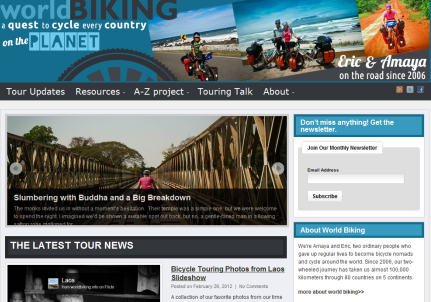 The quick and easy way to find bicycle touring blogs and resources that will entertain, inspire and inform you. We're taking a break! Go Bicycle Touring is on hold at the moment so we are no longer accepting site submissions. We're Amaya and Eric, two ordinary people who gave up regular lives to become bicycle nomads and cycle around the world. Since 2006, our two-wheeled journey has taken us more than 125,000 kilometers through 93 countries on 6 continents. Copyright © 2019 Go Bicycle Touring!. Powered by WordPress. Theme: Spacious by ThemeGrill.